EN 302-2 Adhesives for load-bearing timber structures - Test methods - Part 2: Determination of resistance to delamination - This European Standard specifies a method for determining the resistance to delamination in glue lines. 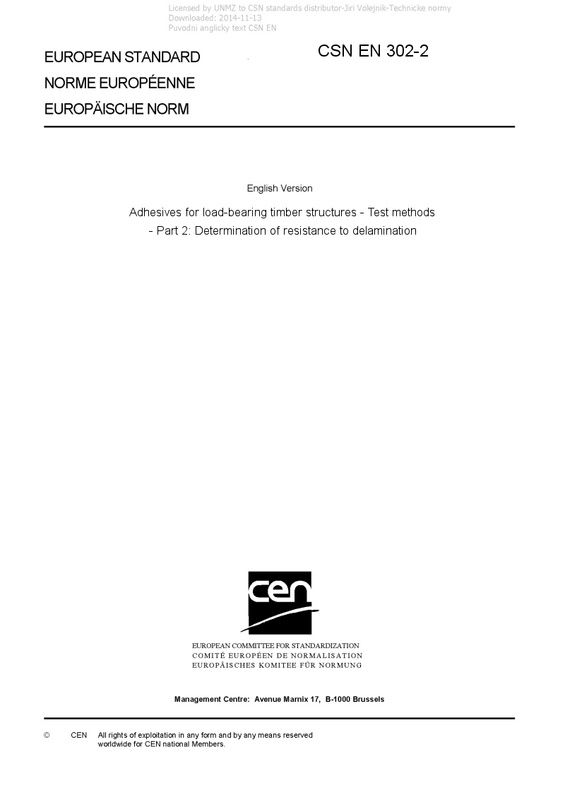 It is suitable for the following applications: a) for assessing the compliance of adhesives with EN 301, EN 15425 and EN 16254; b) for assessing the suitability and quality of adhesives for load-bearing timber structures; c) for comparing the effects on the bond strength resulting from the choice of bonding conditions, from different climatic conditioning and from the treatment of the test pieces before and after bonding. This test is not applicable for modified and stabilized wood with strongly reduced swelling and shrinkage properties, such as acetylated wood, heat-treated wood and polymer impregnated wood. This test is intended primarily to obtain performance data for the classification of adhesives for load-bearing timber structures according to their suitability for use in defined climatic environments. This method is not intended to provide data for structural design, and does not necessarily represent the performance of the bonded member in service.